The United States is home to hundreds of organized hate groups, most of which remain shadowy and anonymous. Americans may see neo-Nazis or Klansmen staging rallies or marches, or may read in the newspaper about some hate crime or terrorist act members of such groups have attempted, but they don’t get to see the composition or inner workings of hate groups. When journalists or others ask extremist groups about their membership, extremists typically refuse to answer or respond with grossly exaggerated numbers designed to inflate the group’s importance. Yet understanding the nature of such groups is crucial to combating their anti-Semitic and racist influences. To this end, the Anti-Defamation League launched an in-depth investigation into the membership of the National Socialist Movement (NSM) that resulted in the complete or partial identification of more than 300 of the group’s approximately 500 members and close associates nationwide. 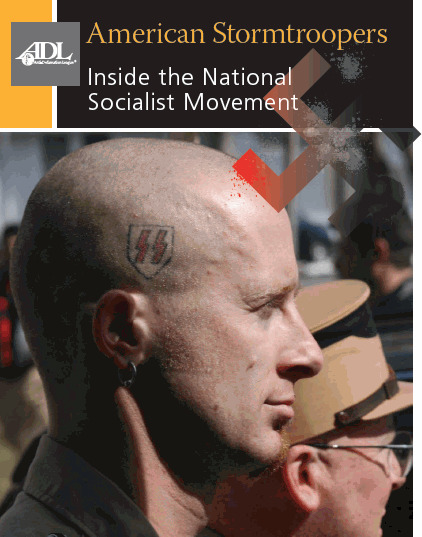 Click here for more information about American Stoormtroopers and the National Socialist Movement.